For me, the opening segment was solid, in that it confirmed a match for the upcoming Survivor Series PPV (Seth Rollins vs. Roman Reigns for the WWE World Heavyweight Championship), as well as the main event for this evening (Team Rollins vs. 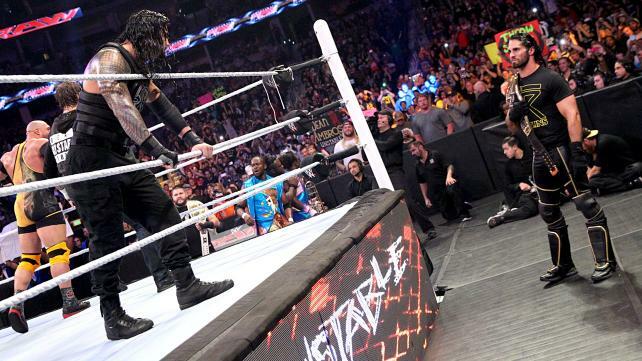 Team Reigns in a Traditional 5v5 Survivor Series Elimination Match) . Roman Reigns opening promo however, didn't get things off to a great start. Part of that is to do with Reigns' performance, which was admittedly wooden at points and unnatural in it's delivery, but the content was also weak, feeling repetitive and losing my attention pretty quickly. 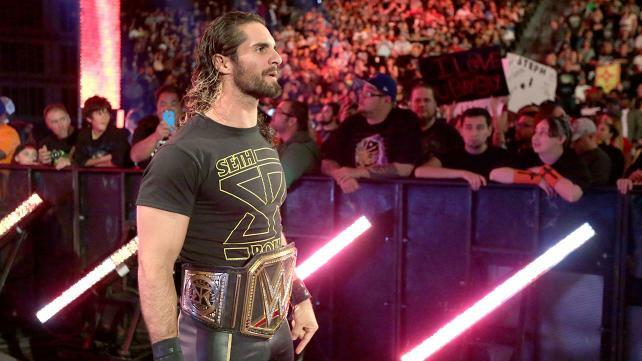 Luckily, once Seth Rollins interrupted, the energy lifted and the WWE World Heavyweight Champions words put Reigns over as a much more believable challenge than Reigns had managed to do earlier. The Juggernaut comes across as much more threatening and charismatic when he has someone to bounce off, WWE need to stop putting him in situations where he is out there on his own as it only extenuates his weaknesses on the mic. A sweet opening contest for TV, Dolph Ziggler and Kevin Owens worked well together here. Owens focusing on The Show Off's left knee from the bell (with Michael Cole doing a stellar job of getting over that Tyler Breeze had injured the knee previously) gave the match a clear narrative throughout. Ziggler may be one of the best in the company when fighting from underneath, his scrappy fighting back and whilst selling the injury, worked into Kevin Owens style well. 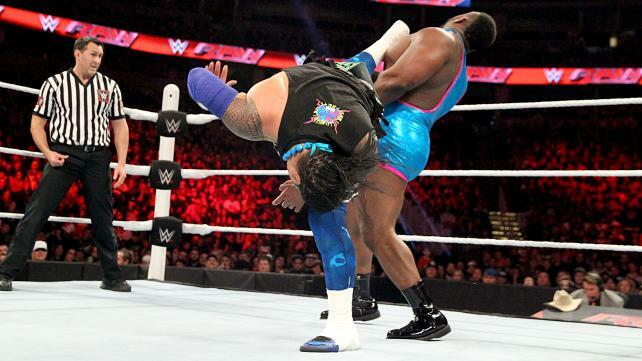 The handful of hope spots that were thrown Ziggler's way were well placed, his massive DDT being the highlight. The crowd could have been into this a little bit more than they were, especially considering Owens and Ziggler are usually two favourites with certain portions of the fans. Tyler Breeze's involvement at ringside was focused on a little bit too much for my liking at times, but having him involved in the finish, allowed Kevin Owens to gain momentum whilst allowing the feud between Breeze and Ziggler to continue to gain traction. This wasn't a terrible contest, but for me it was the least enjoyable of the show this week. Whilst The Miz did allow Cesaro to look like a beast, there were moments that I found myself being pulled out of the action. Miz' chinlock on Cesaro looked ridiculous, with both men for some reason going really over-the-top in their performances. Maybe that's what WWE wants from the "Swiss Superman" as they seem to be positioning him for a feud with Stardust, who was in crowd with The Ascension. I guess they're playing of the "Superman" moniker. At least Cesaro seems to be getting a bit of momentum again, as he managed to pick up the victory with a Cesaro Swing transitioned in a Sharpshooter. Here's hoping the Stardust feud is just a springboard for the former United States Champion. Bray Wyatt explaining what exactly he and his Family had done to The Undertaker and Kane was a strange one. 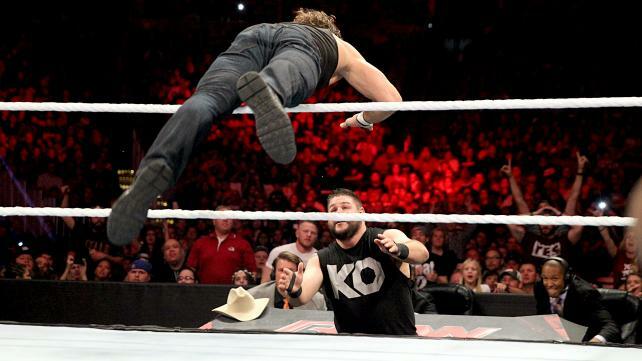 If you missed it, Wyatt let us know that he'd taken their souls and now had their powers. The Eater of World's emotive language "the rotting carcas of the Undertaker"..."scorched body of Kane" was great, it kept me hooked to the screen. His use of language is different to everyone else in the WWE and that makes him incredibly watchable. It was a shame that when he began to use his new powers, proclaiming it was "well within my power to take your world and burn it straight to hell", that all the happened was he "made" some pyro go off on the entrance ramp. If you had the power to destroy the world, why would you even bother wrestling? 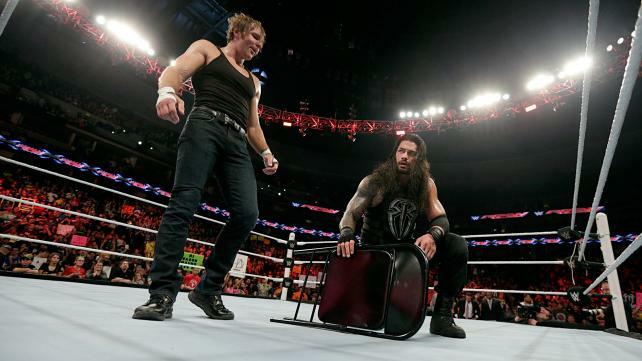 Things went a little too far into the supernatural to sit inside the WWE product for me. As TV tag team bouts go, this was pretty damn good. The two teams gelled well together, as WWE seems to be going forward with Barrett and Sheamus as a duo. The pace of the Lucha Dragons made for a smashing contrast with the brawling stylings of Sheamus and Barrett, which gave the bout a lovely flow. I was literally expecting this to be a four or five minutes squash for Barrett and Sheamus, but as the match continued and continued I found myself getting more and more into the action, with all four men performing very well. The fact that the more experience team managed to pick up the victory, with Kalisto pinning Barrett off a Salida del Sol, made me very happy indeed. Hopefully there's more to come out of these two teams, as this bout felt like to top of the ice berg for the four. Before the main event, this was the longest match of the show, going nearly fifteen minutes. With a solid structure, all four performers put in an effort to keep my attention for the entire contest with a lot of different stories playing out throughout the match. We had Paige's character developmental as she stayed on the outside of the bout taking her chances, as well as Becky Lynch and Sasha Banks putting on a fine technical display, before Becky mixed it up with some pleasing brawling on the outside with Paige. Whilst her performance wasn't bad, Brie Bella looked a little out of place with the other three, and whilst she had some heat early doors it was thrown away when she did the "Yes" kicks off her husband, Daniel Bryan. After some nice near falls for Becky and Sasha, it was Paige he walked out victorious after hitting a Ram-Paige on Becky in a satisfying finish. Part of me wishes WWE had given Sasha the win here, and had two women's singles matches on PPV with Paige and Becky getting another shot at each other, but maybe that was just wishing for a little too much. Before the main event could get under-way, we still needed to find out who would be on Roman Reigns' team. I thought the idea of keeping Reigns' partners under wraps and knowing Rollins team heading in was a clever one, as it begged fans to tune in for the main event to find out who would be on the teams. It kept a thread of unpredictability that we'd seen work so well for John Cena's Open Challenges over the past six months. The Usos return was a nice surprise, that will bring even more depth to WWE's growing tag division and whilst Dean Ambrose involvement was a little predictable, that's only because it made perfect sense due his on-screen closeness with the Juggernaut. I sighed when Ryback came out however, he certainly the least inspiring choice on that team, especially after he lost his feud with Kevin Owens at Hell in a Cell. I can't remember a Survivor Series Elimination bout airing on RAW, I might be wrong though. This provided a unique setting to further the feud between Seth Rollins and Roman Reigns, whilst allowing eight other guys the opportunity to shine and produce new feuds, that can never be a bad thing! The early part of the match showcased The Usos well, with their new red and blue attires being a good way of telling the twins apart! With the duo quickly eliminating Xavier Woods and Kofi Kingston off Frog Splashes, whilst Jey being dominated by the heels early doors was sound psychology in his first match back from injury. Whilst the twins were the first two members of Team Reigns to get eliminated (Jey off a Big Ending from Big E and Jimmy off a Pop-Up Powerbomb from Owens), they looked excellent upon their return and having eliminated two New Day members they're surely next in line for a tag title shot straight away. With the match going over half an hour, the pacing was even more important than usual, especially with the show having to go to two commercial breaks during the match. Roman Reigns spent plenty of time in the ring, perhaps as a way to continue to get him over as a contender for the World Heavyweight Championship. He took a beating from both Rollins and Owens at various points, selling his injuries well on the outside, after we got treated to a hot tag from Ryback. I was especially impressed with Rollins leading into this hot-tag as whilst the crowd was chanting for Dean Ambrose, The Architecht made sure Ambrose couldn't be tagged in by knocking him off the apron, therefore instead of the crowd being disappointed when Reigns tagged Ryback (instead of Ambrose) the crowd could only see The Big Guy on the apron and began to chant "Feed Me More" quality stuff. The crowd was super into this one, especially as the field was wittled down to two on two, with Ambrose and Reigns ending up opposite Rollins and Owens. The villainous duo worked so well together, with their character work being spot on in this section, with Rollins only continuing to shine after Owens had succumbed to the Dirty Deeds of Dean Ambrose (Side note - An Ambrose vs. Owens feud of the IC Title would be brilliant!) Whilst I'd be criticising this finishes if it occurred on PPV, having Rollins try to run away from Ambrose and Reigns made perfect sense both for the character and as a build for PPV. The World Heavyweight Champion levelling his challengers with a Steel Chair to get the disqualified and hand Team Reigns the win was sound booking. It made me want to see more and that's exactly what a television product should be doing. A big improvement on last week's show, which was still a good episode of Monday Night RAW in it's own right. The main event took up 30 minutes of air time and was a delight to watch, great action, enjoyable story-telling and the potential for some interesting new feuds to develop, whilst furthering the issues between Seth Rollins and Roman Reigns and simultaneously promoting their match at Survivor Series and any potential Traditional Elimination bouts that might occur on the PPV. The tag team match pitting The Lucha Dragon against King Barrett and Sheamus, Kevin Owens contest with Dolph Ziggler and the opening segment were all enjoyable also. Cesaro and The Miz's encounter was the weakest (decent length) bout of the evening, but even that had it's plus points ie. Cesaro looking great. Everything else that had a good length to it was somewhere in between, which for Bray Wyatt's funky firework show was little disappointing considering it got a good deal of promotion before airing. After a good week last week and a very good week this week, here's hoping that WWE can continue to build momentum over the next two week's heading toward Survivor Series on the 22nd November.